I went to see Cabaret by a theater company I'd never heard of, in a location I didn't know housed theater. And it was one of those times when I felt so lucky to be in that room, experiencing such an amazing performance of a classic piece of musical theater, with wonderful guests for a post-show discussion. I found out about the show from one of the many theater emails that I get, and since Cabaret is one of my favorites I looked into it. I saw that Bradley Greenwald was playing the emcee, and that was enough to get me there. "There" was a (permanently docked) boat on the Mississippi River in St. Paul, just across from downtown on Harriet Island. A perfectly lovely location and theater, the original Centennial Showboat opened in celebration of Minnesota's Centennial, which as every Minnesota school child knows was in 1958. The current showboat was built new after the original burned in a fire during reconstruction, and houses productions by the University of Minnesota and other local theaters like this one. Frank Theatre has been around for over twenty years, and is "committed to producing unique work that stretches the skills of the artists who create the work while simultaneously challenging the everyday perceptions of the audience through the exploration of ideas and issues of social, political and/or cultural concern." So far I like what I see, and I'll be keeping an eye out for future productions. 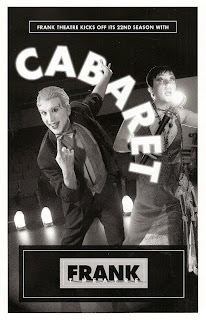 In typical Kander and Ebb style, Cabaret is such a layered, complex piece while still being hugely entertaining. This production focuses more on the story rather than big splashy musical numbers, although with Bradley Greenwald in the cast the music is amazing too. He has an unbelievable voice and can sing anything, and brings a lot of humor and depth to the role of the emcee, our guide through the story. My favorite part of his performance is the opening number in which he sings lines in German, French, and then English. He sings the English lines in a crass, over-exaggerated American accent that's completely fabulous. The other star of the show is Melissa Hart, who plays Fraulein Schneider in this production but played Sally Bowles in the original 1966 Broadway and national touring production. (Lucky for us Melissa moved to Minnesota a few years ago, so I look forward to seeing her on local stages again!) Her history and connection to the show add a lot to the production, in addition to her amazing performance as the landlady who found love late in life, only to lose it. Patrick Bailey is her sweet, funny suitor who doesn't want to face what's happening in Germany. The Kit Kat Klub is filled with great performers, yet they're not too polished as one would expect in a seedy Berlin nightclub. Fraulein Sally Bowles, "the toast of Mayfair" and star of the Klub, is played by Sara Richardson. Not only does she have the look (cute short dark hair, smokey eyes and red cupie doll lips) and the voice, but she also has the vulnerability and strength of Sally. Max Wojtanowicz (who has a lovely voice that I wish we got to hear more of) is the sensible, stable American writer trying to find himself in Berlin, while Sally is flighty and fluttery and scattered. At first I thought Sally was naive, always happy and pretending not to notice what was happening around her. But really, Sally is the realist. She knows how hard life is, she's lived it, and she's just doing what she can to get through the day. Max is the naive idealist who sees everything in black and white, and thinks all of their problems can be solved by taking a train to Paris. When Sally sings the final number, "Cabaret," it's a gut-wrenching performance. The finale of the show features a jumbled sound and look, as everything falls apart in Germany and the Kit Kat Klub. Each of the characters sings a line or two of their song, reminding us of their journey. The stage empties except for the emcee, who sings, "Auf Wiedersehen, A Bientot," followed by a shot and silence. It's so sad, knowing what comes next. Berlin has such a fascinating and tortured history. As if all of that wasn't wonderful enough, the day wasn't over yet. There was a post-show discussion which included director and Frank Artistic Director Wendy Knox, Melissa Hart, choregrapher Bonnie Bottoms, and her mother, Holocaust survivor Sabina Zimering. She wrote a book about how she survived, assuming a false identity and working in Germany. It was so humbling and such an honor to be in her presence, knowing she lived through the reality of the world that Cabaret gave us a glimpse into. And I always love to listen to artists talk about their work, so it was a great ending to a lovely day of theater. What I love most about Kander and Ebb is that they don't shy away from the tough stuff. Starting with Cabaret in 1966, all the way through to their final show Scottsboro Boys which came out just last year, they deal with serious issues such as anti-Semitism in Germany and racism in America. Issues that we like to believe are further in the past than they really are. Kander and Ebb use the art form of musical theater to ask the difficult questions, not necessarily providing answers but encouraging the audience to wrestle with them. It seems Frank Theatre has a similar viewpoint, which is perhaps why they chose this piece and why they do it so well. It's only playing for one more weekend, "good lord willing and the creek don't rise" (literally! ), so go see it if you can!